The most important social event on a school calendar is the high school prom for high school seniors. The occasion is so important that there is a committee that is designated, to plan for the event. The planning includes choosing an event, attire, theme, and anything else that will make a high school prom in Toronto a special occasion. If you are a high school senior planning to attend your high school prom, then there are many things that you need to plan for. Such things include attire, who you will be going with, and means of transportation on how to arrive to the event and back home. When it comes to transportation, let Platinum Party Bus Limos be your prom limo of choice. We feature party bus limos, great for a large groups of people attending the high school prom with you. 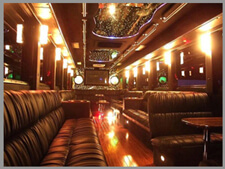 We offer party bus limos that seat 18 – 26 passengers. For larger limo buses that are more luxurious, these buses can seat from 3- - 50 passengers. Whatever you are looking for in a limo rental for your high school prom, look to Platinum Party Bus Limos today. Our limousine drivers are professional at what they do, and you will enjoy your experience when you reserve a limousine bus from Platinum Party Bus Limos in Toronto and the surrounding areas. © 2017 Platinum Party Buses Toronto. All Rights Reserved.